How to Handle Challenges of CWDM Network Testing? CWDM technology has proven itself to be a cost-effective and simplified method for network managers to optimize the existing infrastructure. The adoption of CWDM system into metro and regional network is constantly on the rise and it also extends the reach to the access networks. CWDM is becoming more widely accepted as an important transport architecture owing to its lower power dissipation, smaller size, and less cost. This article will focus on the challenges concerning CWDM network testing, and provide several methods to help overcome them. CWDM configuration is usually based on a single-fiber pair: one fiber is for transmitting and the other for receiving. The following figure shows the most basic configuration of optical network with 4 channel CWDM MUX/DEMUX: it often delivers eight wavelengths, from 1471 nm to 1611 nm, with 20 nm apart. A CWDM architecture is quite simple. It only has passive components like multiplexers and demultiplexers, without any active elements such as amplifiers. However, using CWDM as a means of increasing bandwidth also brings network characterization and deployment challenges, which will be discussed in the following section. The challenges of CWDM network testing mainly lie in three phases: construction and installation, system activation and upgrade or troubleshoot. Here we provide solutions for each. During construction and installation process, it is essential to conduct physical-layer tests on the fiber from the head-end to the destination. Single-ended testing with an OTDR is definitively an advantage as it optimizes labor resources. In this case, the objectives are to characterize the entire link (not only the fiber) to include the add-drop multiplexers (OADM) and to guarantee continuity up to the final destination. 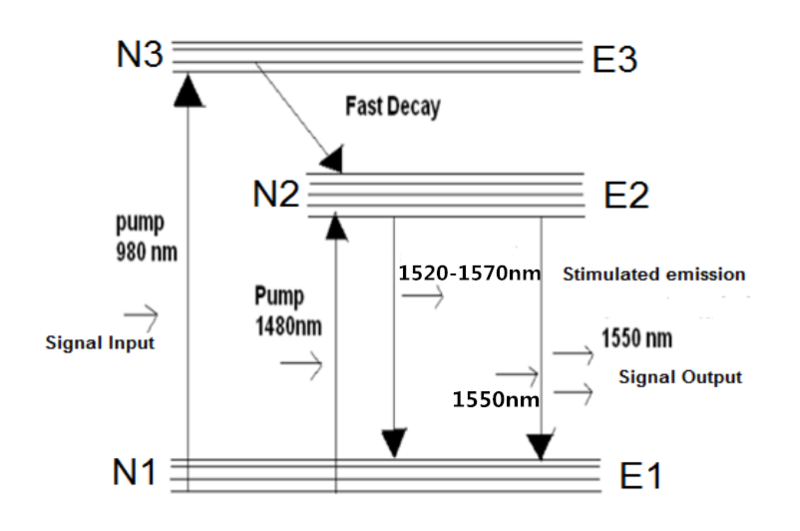 However, testing at standard OTDR wavelengths, such as 1310 nm and 1550 nm, cannot be done in such conditions as these wavelengths are filtered out at either OADM, never reaching the end destination. Then how to test such a link? Solution: Adopting a specialized CWDM OTDR. With CWDM-tuned wavelength, the CWDM OTDR is capable of performing an end-to-end test by dropping each test wavelength at the correspondent point on the network, allowing the characterization of each part of the network directly from the head-end. Which is considered time and labor saving since one don’t have to access. It also helps to speed up the deployment process as the technician will test all drop fibers from a single location. 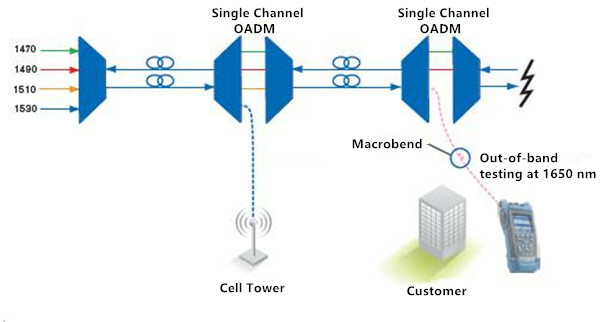 Since CWDM network architecture is rather basic which contains no active components like amplifiers, the only things that can prevent proper transmission in a CWDM network system are transmitter failure, sudden change in the loss created in an OADM or manual errors, bad connections for example. To deal with these problems, one has to look at the signal being transmitted. Solution: A CWDM channel analyzer is ideal to handle this challenge. It works to quickly determine the presence or absence of each of the 16 wavelengths and their power levels. Many CWDM OADM have tap ports, which means that there is a port where a small portion of the signal is dropped. Taps are typically 20 dB weaker than the main signal. If these taps are not present, a CWDM analysis should be performed. It consists of unplugging the end user to use the main feed for the analysis. To be ready for all possibilities, a CWDM channel analyzer should cover a power range going as low as –40 dBm, while being able to test the entire wavelength range in the shortest time as possible. In the maintenance and troubleshoot phrase, when the network is live and a new wavelength is added, one should figure out two questions: is the link properly set up? And is my wavelength presents and well? Solution: Two approaches are available to check if a link is set up properly: a CWDM OTDR approach or an out-of-band approach. The CWDM OTDR approach is relatively simple when a new customer is added. With CWDM OTDR, one can perform CWDM network testing without having to wait for the customer or to go to the cell tower sites. The wavelength can be turned on at the head-end. Which speed testing process greatly. The OTDR and channel analyzer combo are also useful when a single customer has issues. The channel analyzer will reveal if the channel is indeed present and within power budget. If not, the CWDM OTDR can be used to test at that specific wavelength or an out-of-band 1650 nm OTDR test can be performed from the customer’s site to detect any anomalies on the link, all without disconnecting the head-end since the OADM will filter out the 1650 nm, therefore not affecting the remainder of the network. CWDM testing challenges may be inevitable during each phase of the deployment, but with specialized equipment, these challenges can be overcomed completely. Tools including a CWDM OTDR, a CWDM channel analyzer and an out-of band OTDR are proved effective and valuable to reduce downtime and increase bandwidth at a minimum cost. This entry was posted in CWDM & DWDM Solution and tagged CWDM MUX/DEMUX, CWDM OADM, CWDM OTDR, CWDM testing on June 2, 2017 by Amelia.Liu. CWDM systems have channels at wavelengths spaced 20 nanometers (nm) apart, compared with 0.4 nm spacing for DWDM. This allows the use of low-cost, uncooled lasers for CWDM. In a typical CWDM system, laser emissions occur on full eighteen channels at eighteen defined wavelengths: 1610 nm, 1590 nm, 1570 nm, 1550 nm, 1530 nm, 1510 nm, 1490 nm, 1470 nm, 1450 nm, 1430 nm, 1410 nm, 1390 nm, 1370 nm, 1350 nm, 1330 nm, 1310 nm, 1290 nm, 1270 nm. Besides, for CWDM systems an industry standard color coding scheme is used. The latches of the CWDM SFP transceivers match the colored port indicators on the passive units therefore guaranteeing simple setup. Following color codes and wavelength are valid for CWDM. The WDM system uses a multiplexer at the transmitter to combine several wavelengths together, each one carry different signal with bite-rate up to 10G and a demultiplexer at the receiver to split them apart. Both mux and demux are passive, requiring no power supply. The 18 Channels CWDM mux demux covers all channels of 1270nm to 1610nm in 20nm increments. Without replacing any infrastructure, it totally support data rates up to 180 Gbps by being completely protocol transparent. The main fields of applications are the use in SDH (STM-1, STM-4, STM-16, STM- 64), IP (Fast Ethernet, Gigabit Ethernet, 10 Gigabit) ATM and storage (1G, 2G, 4G, 8G, 10G Fibre Channel) networks. 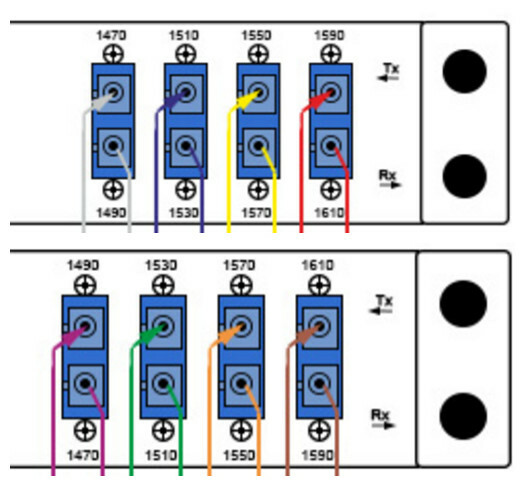 Connectors, located on the front of the CWDM mux demux modules, are labeled and use the same color-coding that is used to indicate the wavelength of the individual CWDM SFP transceivers (shown in the figure below). When fiber availability is limited, CWDM mux demux could increase the bandwidth on the existing fiber infrastructure. By using 18ch CWDM mux demux mentioned above and the CWDM SFP transceivers, up to 180 Gbps could be supported on a fiber pair. CWDM SFP transceiver is based on the SFP form factor which is a MSA standard build. The max speed of this product is 1.25G and they are also available as 2.5G and of course the popular CWDM 10G SFP transceivers. The CWDM SFP transceiver has a specific laser which emits a “color” defined in the CWDM ITU grid. 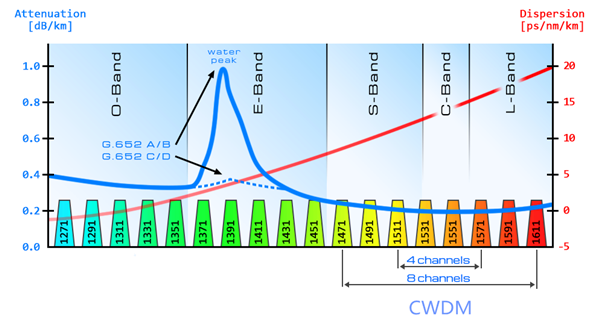 The CWDM ITU grid is defined from 1270 to 1610nm and has steps of 20nm. So the available wavelength is 1270nm, 1290nm, 1310nm, 1330nm, 1350nm, 1370nm, 1390nm, 1410nm, 1430nm, 1450nm, 1470nm, 1490nm, 1510nm, 1530nm, 1550nm, 1570nm, 1590nm and C. Besides, our CWDM SFP transceivers are similarly color-coded as the CWDM mux demux to help you match the right link connection (shown in the figure below). 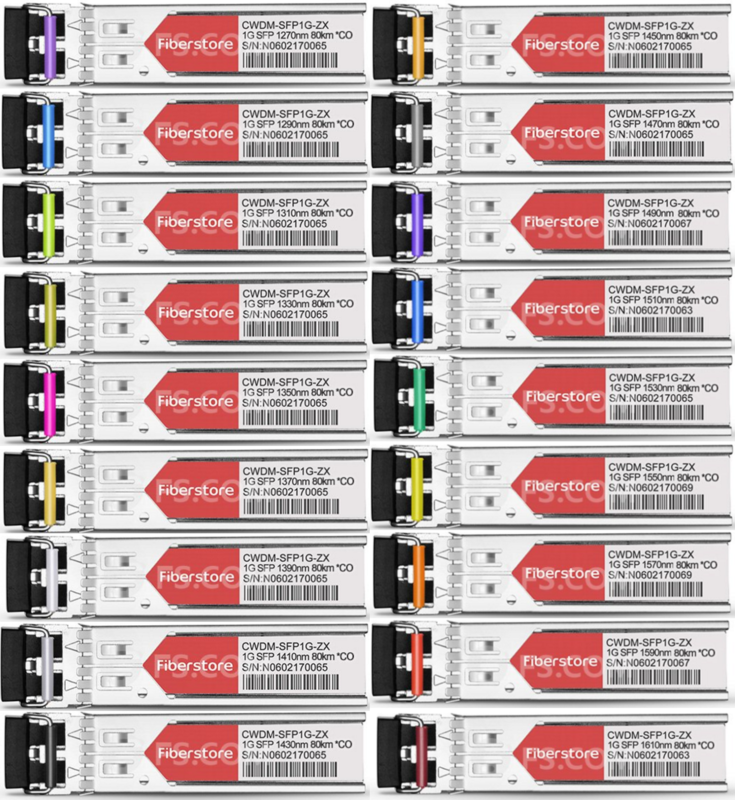 We can make the CWDM SFP transceivers compatible with every brand (Cisco, HP, H3C, Juniper, Huawei, Brocade, Arista). A lot of brands have vendor locking and only with the proper coding. Fiberstore is specialized in this rebranding or recoding. We have many different switches and routers in our test lab to test the coding. We also use different Optical Spectrum Analyzers to ensure the CWDM SFP transceiver is emitting the right color and has the correct power budget. The CWDM SFP transceiver is used in combination with passive CWDM mux demux, and we can provide you a complete solution and advice on which equipment fits best in your project. Please give us your project details and we will provide the most efficient and economical solution. This entry was posted in CWDM & DWDM Solution, SFP Transceiver and tagged Cisco SFP+, cwdm channels, cwdm mux, cwdm mux demux, CWDM SFP, CWDM SFP Transceivers, mux demux, SFP port on October 19, 2016 by Alice.Gui. Dense Wavelength Division Multiplexing (DWDM) enables carrier’s networks to accommodate many hundreds of aggregated services of any sub-rate protocol without installing additional dark fiber. DWDM SFP+ transceiver is mainly manufactured for carriers and large enterprises that need a scalable, flexible, cost-effective system for multiplexing, transporting and protecting high-speed data, storage, voice and video applications. The Cisco DWDM SFP+ transceiver modules are fiber line cards for a wide variety of Cisco switches, routers, and other equipment. They allow enterprises and service providers to provide scalable and easy-to-deploy 10-Gbps LAN, WAN, and optical transport network (OTN) services in their networks. According to DWDM ITU (ITU-T G.694.1) channels, Cisco DWDM SFP+ transceivers are provided with 40 channels, from C20 1561.41nm to C59 1530.33nm (shown in the table below). In fact, not all Cisco switches can be supported for DWDM SFP+ transceivers. According to Cisco 10-Gigabit Ethernet Transceiver Modules Compatibility Matrix, there are 72 types of Cisco switches are available to support DWDM SFP+ transceivers. But only 19 of them can support be supported all 40 channels DWDM SFP+ transceivers (shown in the table below). To build a complete DWDM network in your system, except for switches and DWDM SFP+ transceivers, you also usually need a DWDM mux/demux module. At present, DWDM mux/demux modules are available in 2 channels to 96 channels. Since Cisco DWDM SFP+ transceivers are available in 40 channels (from C20 1561.41nm to C59 1530.33nm ), now I will take 40 channels C20-C59 DWDM mux/demux module (show in the figure below) for example to explain how it works. Front panel of above 40 channels C20-C59 DWDM mux/demux module are shown in the figure below. Connectors, located on the front of the DWDM mux/demux modules, are labeled and use the same channel that is used to indicate the wavelength of the individual DWDM transceivers. Use a pair of 40 channels C20-C59 DWDM mux/demux modules, 40 signals can be transmitted over one fiber pair, which greatly reduces the cabling cost. 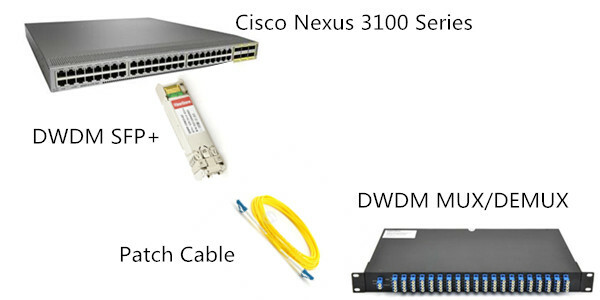 Now, let’s use Cisco compatible DWDM SFP+ to connect DWDM transport to your Cisco 10G SFP+ switches! This entry was posted in CWDM & DWDM Solution and tagged Cisco DWDM, DWDM SFP on May 25, 2016 by Alice.Gui. When we demand for higher bandwidth, we often choose to install new fiber. However, that is an expensive solution. Then what should we do? 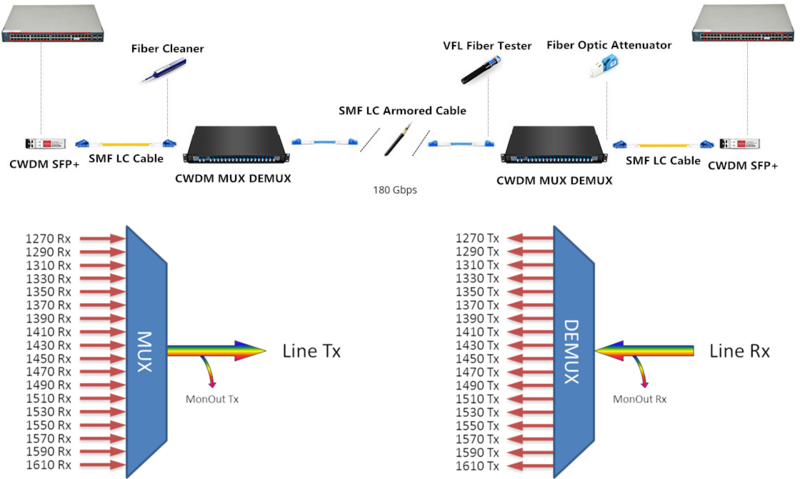 Now this article will give you a less expensive solution—using CWDM Mux/Demux with CWDM transceivers, which may allow you to maximize capacity and increase bandwidth on existing fiber route by multiplexing several distinct signals or protocols over a single or duplex-fiber connection. The passive optical CWDM Mux/Demux usually utilizes a thin-film filter and circulator technology. They are available in various wavelength combinations based on the entire wavelength spectrum (1270nm–1610nm in 20nm increments) defined by the ITU G.694.2 CWDM standard. Accordingly, CWDM transceivers are also available in 1270nm–1610nm (20nm spacing). Since CWDM Mux/Demux can support 18 wavelengths include 1270, 1290, 1310, 1330, 1350, 1370, 1390, 1410, 1430, 1450, 1470, 1490, 1510, 1530, 1550, 1570, 1590 and 1610 nano-meters. Therefore, in the market, the channels of CWDM Mux/Demux varies from 2 channels to 18 channels. In this article, we may introduce these 4 channels CWDM Mux/Demux in detail. Using methods of other channel CWDM Mux/Demux can all reference 4 channels CWDM Mux/Demux.4 channels CWDM Mux/Demux is available in any four wavelengths from 1270nm–1610nm (20nm spacing). At present, CWDM Mux/Demux is available in dual fiber and single fiber two types. In the following passages, I will take 4 channels 1510-1570nm dual fiber CWDM Mux/Demux and 4 channels 1470-1590nm single fiber CWDM Mux/Demux for example to tell you how to use them in your network. To install a 4 channels 1510-1570nm dual fiber CWDM Mux/Demux in your network, you need a pairs of 4 channels 1510-1570nm dual fiber CWDM Mux/Demux. For dual fiber link CWDM Mux/Demux, the Mux/Demux are always the same (shown in the following picture). Just shown as the following picture. 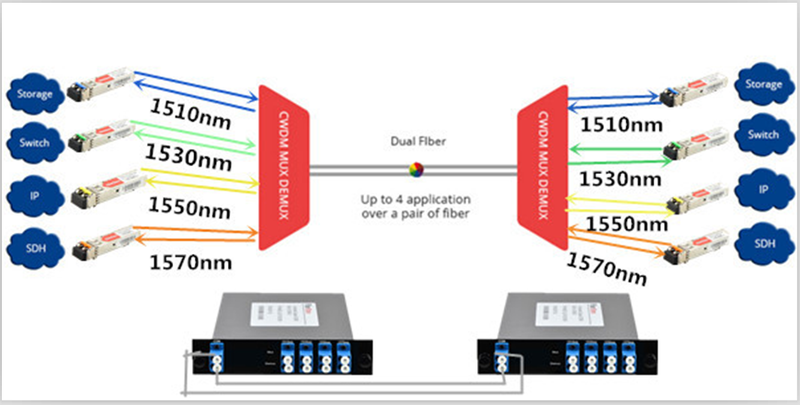 To install a 4 channels 1510-1570nm dual fiber CWDM Mux/Demux in your network, you just need a pair of 4 channels 1510-1570nm dual fiber CWDM Mux/Demux, a 1510nm SFP, 1530nm SFP, 1550nm SFP and a 1570nm SFP. To install a 4 channels 1470-1590nm single fiber CWDM Mux/Demux in your network, you also need a pairs of 4 channels single fiber CWDM Mux/Demux. But for single fiber Mux/Demux, they are not the same. If you install a 4 channels 1470-1590nm single fiber CWDM Mux/Demux on one end, you may need to install a 4 channels 1490-1610nm single fiber CWDM Mux/Demux on the other end (shown in the following picture). Just shown as the following picture. To install a 4 channels 1470-1590nm single fiber CWDM Mux/Demux in your network, you need a 4 channels 1470-1590nm single fiber CWDM Mux/Demux and 4 channels 1490-1610nm single fiber CWDM Mux/Demux pair. And a 1470nm SFP, 1510nm SFP, 1550nm SFP and 1590nm SFP for 4 channels 1470-1590nm single fiber CWDM Mux/Demux. A 1490nm SFP, 1530nm SFP, 1570nm SFP, 1610nm SFP for 4 channels 1490-1610nm single fiber CWDM Mux/Demux. This entry was posted in CWDM & DWDM Solution, WDM System and tagged CWDM MUX/DEMUX, CWDM transceivers on May 19, 2016 by Alice.Gui. 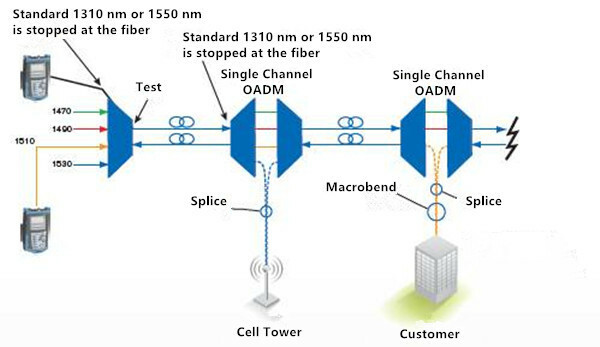 In optical fiber communications system, several transmission bands have been defined and standardized, from the original O-band to the U/XL-band. The E- and U/XL-bands have typically been avoided because they have high transmission loss regions. The E-band represents the water peak region, while the U/XL-band resides at the very end of the transmission window for silica glass. Intercity and metro ring fiber already carry signals on multiple wavelengths to increase bandwidth. Fibers entering the home will soon do the same. Now there are several types of optical telecom systems have been developed, some based on time division multiplexing (TDM) and others on wavelength division multiplexing (WDM), either dense wavelength division multiplexing (DWDM) or coarse wavelength division multiplexing (CWDM). This article may represent the evolution of optical wavelength bands mainly by describing these three high-performance systems. DWDM systems were developed to deal with the rising bandwidth needs of backbone optical networks. The narrow spacing (usually 0.2 nm) between wavelength bands increases the number of wavelengths and enables data rates of several Terabits per second (Tbps) in a single fiber. These systems were first developed for laser-light wavelengths in the C-band, and later in the L-band, leveraging the wavelengths with the lowest attenuation rates in glass fiber as well as the possibility of optical amplification. Erbium-doped fiber amplifiers (EDFAs, which work at these wavelengths) are a key enabling technology for these systems. Because WDM systems use many wavelengths at the same time, which may lead to much attenuation. Therefore optical amplification technology is introduced. Raman amplification and erbium-doped fiber amplifiers are two common types used in WDM system. In order to meet the demand for “unlimited bandwidth,” it was believed that DWDM would have to be extended to more bands. In the future, however, the L-band will also prove to be useful. Because EDFAs are less efficient in the L-band, the use of Raman amplification technology will be re-addressed, with related pumping wavelengths close to 1485 nm. 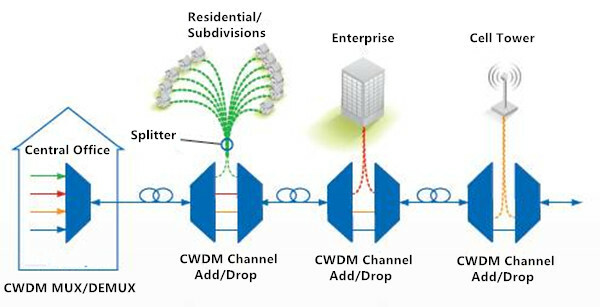 CWDM is the low-cost version of WDM. Generally these systems are not amplified and therefore have limited range. They typically use less expensive light sources that are not temperaturestabilized. Larger gaps between wavelengths are necessary, usually 20 nm. Of course, this reduces the number of wavelengths that can be used and thus also reduces the total available bandwidth. Current systems use the S-, C- and L-bands because these bands inhabit the natural region for low optical losses in glass fiber. Although extension into the O and E-band (1310 nm to 1450 nm) is possible, system reach (the distance the light can travel in fiber and still provide good signal without amplification) will suffer as a result of losses incurred by use of the 1310 nm region in modern fibers. TDM systems use either one wavelength band or two (with one wavelength band allocated to each direction). TDM solutions are currently in the spotlight with the deployment of fiber-to-the-home (FTTH) technologies. Both EPON and GPON are TDM systems. The standard bandwidth allocation for GPON requires between 1260 and 1360 nm upstream, 1440 to 1500 nm downstream, and 1550 to 1560 nm for cable-TV video. To meet the rise in bandwidth demand, these systems will require upgrading. Some predict that TDM and CWDM (or even DWDM) will have to coexist in the same installed network fibers. To achieve this, work is underway within the standardization bodies to define filters that block non-GPON wavelengths to currently installed customers. 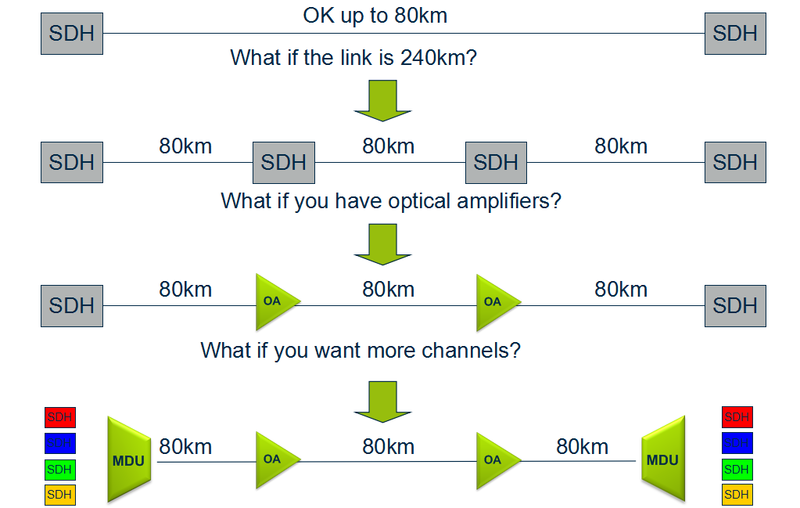 This will require the CWDM portion to use wavelength bands far away from those reserved for GPON. Consequently, they will have to use the L-band or the C- and L-bands and provided video is not used. In each case, sufficient performance has been demonstrated to ensure high performance for today’s and tomorrow’s systems. From this article, we know that the original O-band hasn’t satisfied the rapid development of high bandwidth anymore. And the evolution of optical wavelength bands just means more and more bands will be called for. In the future, with the growth of FTTH applications, there is no doubt that C- and L-bands will play more and more important roles in optical transmission system. Fiberstore offer all kinds of products for WDM optical network, such as CWDM/DWDM MUX DEMUX and EDFA. For more information, please visit www.fs.com. This entry was posted in CWDM & DWDM Solution and tagged CWDM, DWDM, EDFA, EPON, FTTH, GPON, optical wavelength bands, TDM, WDM on October 13, 2015 by Alice.Gui. DWDM increases the bandwidth of an optical fiber by multiplexing several wavelengths onto it. Even though it costs more than CWDM, it is currently the most popular WDM technology because it offers the most capacity. This article provides an overview of DWDM networks and its current applications. Dense wavelength-division multiplexing (DWDM) revolutionized data transmission technology by increasing the capacity signal of embedded fiber. This increase means that the incoming optical signals are assigned to specific wavelengths within a designated frequency band, then multiplexed onto one fiber. By providing channel spacings of 50 GHz (0.4 nm), 100 GHz (0.8 nm) or 200 GHz (1.6 nm), several hundreds of wavelengths can be placed on a single fiber. 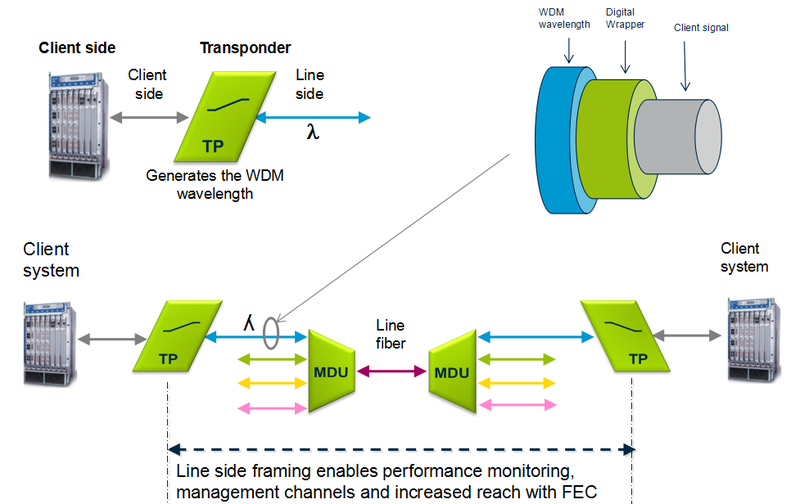 DWDM takes advantage of the operating window of the Erbium Doped Fibre Amplifier (EDFA) to amplify the optical channels and extend the operating range of the system to over 1500 kilometers. The following picture shows the operation of a DWDM system. Important components for DWDM systems are transmitters, receivers, optical amplifiers, transponders, DWDM multiplexers, and DWDM demultiplexer. These components, along with conforming to ITU channel standards, allow a DWDM system to interface with other equipment and to implement optical solutions throughout the network. Transmitters are described as DWDM components since they provide the source signals which are then multiplexed. The characteristics of optical transmitters used in DWDM systems are highly important to system design. Multiple optical transmitters are used as the light sources in a DWDM system. Here we can ues a transceiver to replace transmitters and receivers, since it is the combiantion of them. Transceivers applied in DWDM network are often called the DWDM transceiver, of which the transmission distances can reach up to 120 km. The following picture shows the receivers and transmitters in DWDM systems. Optical amplifiers (OAs) boost the amplitude or add gain to optical signals passing on a fiber by directly stimulating the photons of the signal with extra energy. They are “in-fiber” devices. OAs amplify optical signals across a broad range of wavelengths. This is very important for DWDM system application. Erbium-doped fiber amplifiers (EDFAs) are the most commonly used type of in-fiber optical fibre. Following picture shows the operation of OA. Transponders convert optical signals from one incoming wavelength to another outgoing wavelength suitable for DWDM applications. Transponders are optical-electricaloptical (O-E-O) wavelength converters. A transponder performs an O-E-O operation to convert wavelengths of light. Within the DWDM system a transponder converts the client optical signal back to an electrical signal (O-E) and then performs either 2R (reamplify, reshape) or 3R (reamplify, reshape, and retime) functions. The following picture shows the operation of bidirectional transponder. A transponder is located between a client device and a DWDM system. From left to right, the transponder receives an optical bit stream operating at one particular wavelength (1310 nm). The transponder converts the operating wavelength of the incoming bitstream to an ITU-compliant wavelength. It transmits its output into a DWDM system. On the receive side (right to left), the process is reversed. The transponder receives an ITU-compliant bit stream and converts the signals back to the wavelength used by the client device. 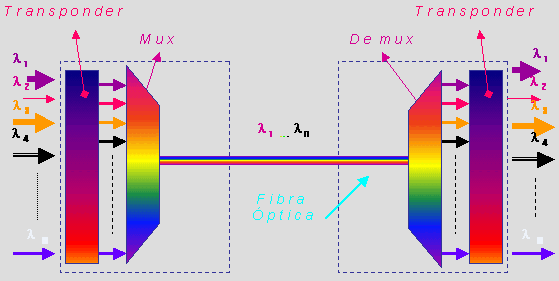 Multiple wavelengths (all within the 1550 nm band) created by multiple transmitters and operating on different fibers are combined onto one fiber by way of an optical multiplexer. The output signal of an optical multiplexer is referred to as a composite signal. At the receiving end, a demultiplexer separates all of the individual wavelengths of the composite signal out to individual fibers. The individual fibers pass the demultiplexed wavelengths to as many optical receivers. Typically, mux and demux (transmit and receive) components are contained in a single enclosure. Optical mux/demux devices can be passive. Component signals are multiplexed and demultiplexed optically, not electronically, therefore no external power source is required. Following picture shows the operation of DWDM multiplexers and demultiplexers. As occurs with many new technologies, the potential ways in which DWDM can be used are only beginning to be explored. Already, however, the technology has proven to be particularly well suited for several vital applications. DWDM is ready made for long-distance telecommunications operators that use either point–to–point or ring topologies. The sudden availability of 16 new transmission channels where there used to be one dramatically improves an operator’s ability to expand capacity and simultaneously set aside backup bandwidth without installing new fiber. This large amount of capacity is critical to the development of self-healing rings, which characterize today’s most sophisticated telecom networks. By deploying DWDM terminals, an operator can construct a 100% protected, 40 Gb/s ring, with 16 separate communication signals using only two fibers. Operators that are building or expanding their networks will also find DWDM to be an economical way to incrementally increase capacity, rapidly provision new equipment for needed expansion, and future–proof their infrastructure against unforeseen bandwidth demands. This entry was posted in CWDM & DWDM Solution and tagged DWDM 10G SFP+, DWDM demultiplexer, DWDM EDFA, DWDM multiplexer, DWDM transceiver, DWDM Transponder on May 25, 2015 by Alice.Gui. 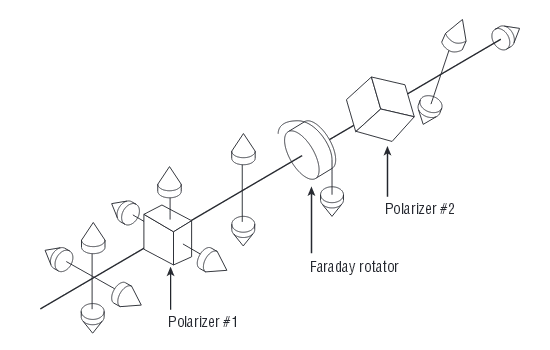 Connectors and other types of optical devices on the output of the transmitter may cause reflection, absorption, or scattering of the optical signal. These effects on the light beam may cause light energy to be reflected back at the source and interfere with source operation. To reduce the effects of the interference, an Optical Isolator is used. Many laser-based transmitters and Optical Amplifiers use an optical isolator because the components that make up the optical circuit are not perfect. The optical isolator comprises elements that will permit only forward transmission of the light; it does not allow for any return beams in the fiber transmission routes or in the optical amplifiers. There are a variety of optical isolator types, such as Polarized (dependent and independent), Composite, and Magnetic. As mentioned, the Polarized Optical Isolator transmits light in one direction only. This is accomplished by using the polarization axis of the linearly polarized light. The incident light is transformed to linearly polarized light by traveling through the first polarizer. The light then goes through a Faraday rotator; this takes the linearly polarized light and rotates the polarization 45 degrees, then the light passes through the exit polarizer. 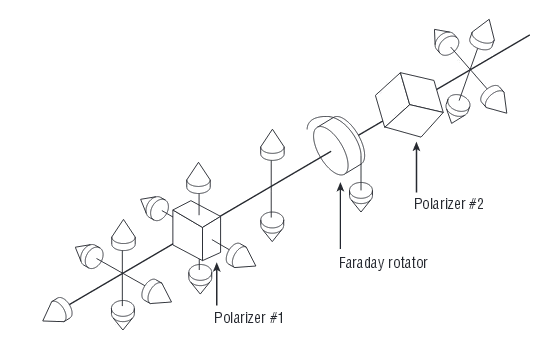 The exit polarizer is oriented at the same 45 degrees relative to the first polarizer as the Faraday rotator is. With this technique, the light is passed through the second polarizer without any attenuation. This technique allows the light to propagate forward with no changes, but any light traveling backward is extinguished entirely. The loss of backward-traveling light occurs because when the backward light passes through the second polarizer, it is shifted again by 45 degrees. The light then passes through the rotator and again is rotated by 45 degrees in the same direction as the initial tilt. So when the light reaches the first polarizer, it is polarized at 90 degrees. And when light is polarized by 90 degrees, it will be “shut out.” The figures below show the forward- and reverse-transmitted light in a dependent polarized optical isolator. It should be noted that these figures depict the dependent type of polarized optical isolator. There is also an independent polarized optical isolator. The independent device allows all polarized light to pass through, not just the light polarized in a specific direction. The principle of operation is roughly the same as the dependent type, just slightly more complicated. Tips: The Independent Optical Isolators are frequently used in EDFA Optical Amplifiers. In fact, Composite Optical Isolator is a type of polarization independent isolator used in the EDFA optical amplifier. The EDFA optical amplifier is comprised of Erbium-Doped Fiber, Wavelength-Division Multiplexer, Pumping Diode Laser, Polarization Independent Isolator, and other passive components. Because the polarization independent isolator is composited with the others components into a single EDFA module, it is called a Composite Optical Isolator. Magnetic Optical Isolator is another name for polarized optical isolator. The magnetic portion of any isolator is of great importance. As mentioned, there is a Faraday rotator in the optical isolators. The Faraday rotator is a rod composed of a magnetic crystal having a Faraday effect and operated in a very strong magnetic field. The Faraday rotator ensures that the polarized light is in the correctly polarized plane, thus ensuring that there will be no power loss. 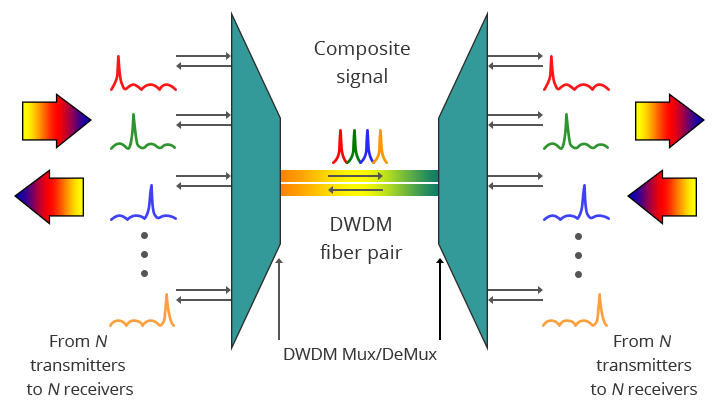 Here is a figure that shows a basic magnetic optical isolator. Optical isolators are used to ensure stabilization of laser transmitters and optical amplifiers as well as to maintain good transmission performance. Ultra speed and large capacity optical fiber trunk systems are expanding as a result of the development of optical amplifiers. In parallel, the demand for optical isolators is increasing. Demand is also expected to increase as LAN and other subscriber fiber optic networks expand. It is therefore imperative that optical isolators be further improved to achieve higher performance, smaller size, and lower price. 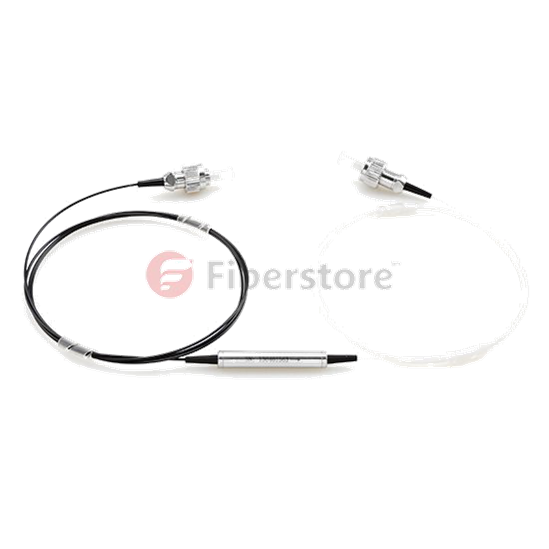 Luckily, you can now find the best optical isolators solution in Fiberstore, a Manufacturer & Supplier of Fiber Optic Network Solutions focus on Professional Customization. This entry was posted in Optical Isolator and tagged composite optical isolator, EDFA Optical Amplifier on January 27, 2015 by Amelia.Liu.